Two fools in love: The Keck! 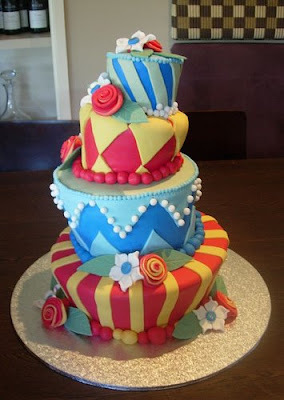 Okay, this cake might be a little too celebratory but, like a toddler, I am still drawn to bright, colorful things (like my future husband who sports a coif that, at the proper angle, reflects harmful UV rays back into the atmosphere which is why he doesn't have as many wrinkles as I do. True story). Back to the cake, this lady made it. Now here is a cake Philip would really love. He adores sushi. I came across this image at Baking Bites. There is a blog and instructions about how the cake was made (including some pictures of a dessert cake made with fresh fruit) here. 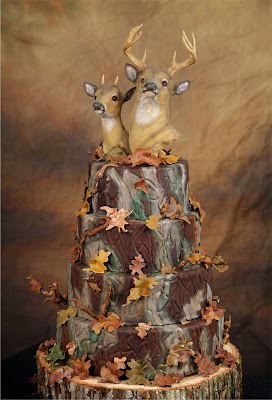 I came across Cake Wrecks awhile ago, and decided to see if they had a Southern-style cake disaster for me to post. Whaddaya know. They did. We Southerners are born with a proclivity to take decent traditions and shroud them in camoflage and antlers, both literally *and* metaphorically speaking. If you need a good laugh during the day, head on over to the web site and scroll through some of the sweetest disasters ever. Alright, next time I will present some actual cake options.